Our routines don’t come naturally to us but we are smart and we can learn anything put in front of us if we want to! You come to FlyLady trying to find a way to get your home clean. You heard that we teach you how to clean, well that is not exactly the truth. Most of us have been taught how to clean by forced labor of trial and error when we were children. You know the drill; if you don’t clean it right then you are going to have to redo it! There is another order yelled at us and we were just children; GO CLEAN YOUR ROOM. The sad part was that we didn’t know where to start. We were told to do it, yet no one ever took the time to teach us how to do it. What we teach you is to relieve the stress of life by establishing simple habits and string them into a peaceful dance to help you glide through your day. Doesn’t that just sound sweet. These little habits become automatic like our Born Organized family’s habits. The difference is we have made a conscious effort to build these habits. We CAN learn new tricks when the student is ready and it is your idea. The secret is making it fun for you. All we have ever wanted to do is just go out and play. Our routines free us to FLY! Our routines get things done so we can have more fun and enjoy our home and our families. We have developed tools to help you to have fun and get things done but the best part is that we teach you how to establish habits. Without the habits the tools don’t get used. If you don’t use something to me it is just more clutter. If you don’t use your duster it is going to fall apart because of the dust mites eat it. This is why we teach you how to use your calendar. If you are not going to use it then I don’t want you to buy it! When I first started developing my calendar habit I tried every day planner, wall calendar and desk calendar I could get my hands on. I spend hundreds maybe even a thousand dollars over the years searching for the perfect calendar. What I learned is that they are all good if you learn to use them. They are all bad if you don’t establish a habit of looking at your calendar before you go to bed and first thing when you get up in the morning. Many an appointment has been missed because we forgot to recheck the calendar in the morning. This is just half of the routine. We also need a routine for when we come home and when our children come home. Because a calendar is not going to do you any good if you don’t ever put stuff on it. A calendar is there for you not to have to try to remember everything. We need a daily routine for checking the calendar; Morning and Night. We need a “get home routine” or an Afternoon Routine for making sure everything has been put on the calendar after a busy day at work and school. This is when things get pulled out of the back packs and purses. We need a weekly routine of syncing everyone’s schedule to this week’s family schedule on the wall calendar so that everyone in the household can see it in the kitchen. Everyone knows where everyone else is. This helps to reduce the stress of our busy lives. Do this at a weekly family meeting. Robert and I sync our schedules at dinner on Sunday night. Each night before we go to bed we tell each other what is on our plates for tomorrow. See how simple this is! The best part is that your children learn how to use a calendar because they have been a part of the process. Don’t be afraid you are going to mess up the calendar. I know this feeling. This is perfectionism. This is why we use stickers. Not only are they fun on the calendar but they cover up scribbles and mistakes. I like to use small address labels to put things on the calendar. I color code them. My color code for interviews is red. I can look up on the calendar and if I see red, I know I have an interview or radio show. You can use a different color for each child. Sharpies bleed through the paper so this is why I put it on an address label first. Some people use colored pencils. The secret to keeping up with the colored pens, markers and pencils is to tape dental floss or string to them and hang them from the calendar. I use a magic marker to color code the labels and stick them in the calendar so I don’t have to do this every time. You can use any calendar but you are going to have a hard time finding one that has instructions on how to incorporate it into your lives. Most calendars are built by Born Organized people; they think calendars are self-explanatory. The instructions are not included with the calendar but you get those from our emails and on our website. We want you to go from Calendar Challenged to Calendar Successful. We want you to teach your children this calendar habit too. Calendar Successful is a stress free way to live. Our calendars give you enough room to post all of your busy schedule. They become the milestones of your life. I even use mine to post my number from the scale each morning. Some people post their dinner menu on their calendar. This is your family calendar! Use it! Love it! Many people can’t live without it! Developing the Calendar habits are going to change your life! Are you ready to FLY with this tool guiding you through your day! Use Coupon Code CHORES610 to save 20%. Calendars are for writing on! What good is an empty calendar! Here is a video that is filled with lots of great tips that I have collected over the years! 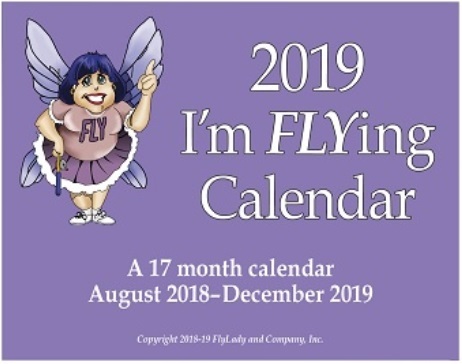 This entry was posted in Ask FlyLady and tagged babysteps, calendar, flylady, get organized, stress free. Bookmark the permalink.